Morpheas Apartments offer 4 different room types to their clients which differ in size and occupancy possibilities. Room types A, C and D have a fully equipped kitchenette with fridge-freezer, coffee maker, electric cooking rings or electric cooker with oven, extractor fans, electric kettle. They are fully equipped with saucepans, crockery and cutlery for the number of persons that the room accommodates. Extras on request at the reception. Room type B, although it has no kitchenette, it has a fridge and the necessary equipment for making a breakfast. Double Studio with double bed or two single beds with view to the Lybian Sea. is a Double bedded room with fridge, also with view to the Lybian Sea. Double Studio Plus is larger than room type A. The studios have the possibility of accommodating until 4 persons. These studios have view to the sea or lateral sea and mountain view and are rented to 2 – 4 persons. is an apartment with 2 bedrooms and 4 – 5 beds, one double bed and 2 or 3 single beds. The apartments are rented to 2 – 5 persons. Some of them have sea view, others have view to the mountains. 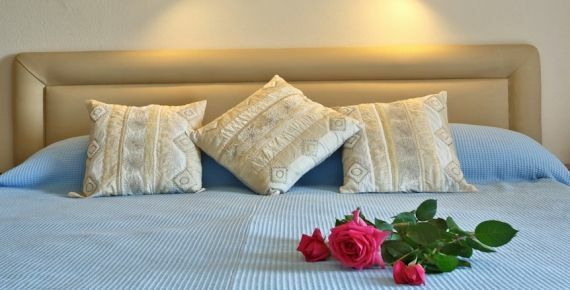 have private bathrooms with shower or bathtub, hairdryer, balconies, shutters, double glazed windows, phone, 32″ Plasma Sat-TV, private air conditioning, Wi-Fi Internet access private parking without charge, orthopedic mattresses and pure cotton bed linen and towels. The apartments have also a washing machine. Daily room cleaning and towels change, linen change twice per week.